Wine is taken in Italy as seriously as food and there is perhaps only one country in the world that takes both as seriously: France. Ask a French or Italian person where the best wine in the world comes from and they will invariably put their money on their nations produce. Tell them otherwise and you will get in an argument which reason will not diffuse. For fun one day try provoking such a debate between a French and Italian person! Putting aside the fact that these days there are very good rival vineyards in the New World when it comes to high quality wine, Italy must come top of the list when it comes to the entire wining and dining experience. Abundant crops over millennia have led to a culture practically defined by dining. Football and the Catholic Church come close behind, but not before a good meal. Wine is central to the experience of eating and is served as an aperitif, with a main meal, and between courses. Guests are often offered wine as a matter of courtesy upon entering a house. It has been said in the past that the Italians love of wine has led them to keep the best home produce to themselves and to export the rest! Whilst this may have been true, advances in wine making technology in Italy have improved quality across the board; hence the world is beginning to appreciate Italian wine like never before. Italy is the most diverse wine growing region in the world, with Italian patriotism matched only by regional parochialism. Each region has their own food variations and produces their own wine to suit. There are 900’000 Vineyards registered in Italy, and nobody knows quite how many wines. That means there is a vineyard for every 7 people! Piedmont: A variation of reds from medium bodied to fruity and light and sweet whites. 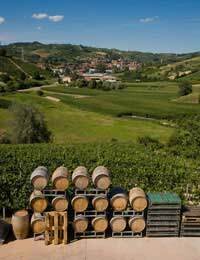 The Tre Venezie: A region easily influenced by neighbouring France, Pinot Grigio, Chardonnay and Cabernet Franc stand up convincingly alongside the local Valpolicella and Amarone. Tuscany: Tuscany is famed for its wine, it being linked even more closely than any other region to their diet. Some would argue that wine is their diet! The terrain and climate is so varied as to make a simple summery of Tuscan wine difficult. The Red Chianti is by far the most famous of these, buoyed by improving techniques. More than any country Italy benefits from a visit when looking to appreciate the food and wine. Many such visits are available with tours of the vineyard including a talk, and of course wine tasting… and the eating of food! Most Italians have a good knowledge of, and passion for, wine and will be more than happy to talk about Italian wine, such is the patriotic fervour it induces. See accompanying articles for a more in depth look at Italy’s main wine regions.